Welcome to Man's most magnificent achievement in the conquest of space, the man-made planetoid SPACE ACADEMY, founded in the Star Year 3732. Here we have gathered young people from the farthest reaches of all the known worlds. They have been chosen for their unique abilities, and are being trained to cope with the mysterious, the unknown, the unpredictable dangers lurking in the vast darkness of space! Space Academy is a Saturday morning live-action sci-fi series that aired on CBS in the Fall of 1977. Produced by Filmation with executive producers Norm Prescott and Lou Scheimer, the show is a transitional series that branches out between the pre- and post- Star Wars era. As a children’s show, there were thrills, but no real violence. Most scenarios involved threats to individuals or Space Academy itself that were usually resolved through cooperation and understanding. The complete series, including episode descriptions and links to individual episodes, is available below on an Aeolus 13 Umbra YouTube channel. The show presented different genders and ethnicities, so the Space Academy students include young men and women with ethnically diverse backgrounds including Asian, African, and European. This was reflective of the era, but it also made good business sense in that it gave a broad spectrum of the audience something to identify with on the show. The series featured Jonathan Harris (the scene-stealing Dr. Zachery Smith on Lost in Space) as the three-century old Commander Gampu, and noted child actors Pameyln Ferdin as Laura Gentry and Brian Tochi as Tee Gar. Both Ferdin and Tochi both appeared in Star Trek: The Original Series’ episode “And the Children Shall Lead,” and were fairly familiar faces on TV in the 1960s and 1970s. Also of note, Ric Carrott, who originated the role of Chuck Cunningham on Happy Days, plays Laura’s brother Chris. Eric Greene is the blue-haired alien child Loki, and of course there’s Peepo, the show’s resident R2D2 clone. Other students include Paul (Ty Henderson) and Adrian (Maggie Cooper). Some of the team members have special abilities: Chris and Laura have psychic powers, Tee Gar has "near superhuman strength," Paul has a high IQ, and Loki can teleport. 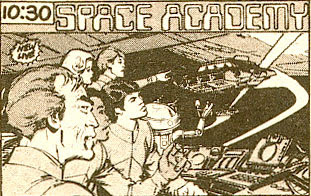 Space Academy Tagline: Study hard, meet aliens, take tests, fly starships . . .
Class was never this much fun at YOUR school! Producer Lou Scheimer, in the 2007 documentary Back to School with Space Academy included with the series’ DVD release, reports that the idea for the show originated with Allen Ducovny, a former CBS executive who worked with Filmation on its 1960s The New Adventures of Superman cartoon series and previously produced the original Superman radio show (both featuring voice actor Bud Collyer in the title role). Ducovny had wanted to do a Space Academy-themed radio show centered around young people and proposed to Scheimer that Filmation produce it for television. Pre-production on the series took place in the months prior to the release of Star Wars in May 1977, while production of all fifteen episodes occurred over the course of eight weeks during the summer of the same year. The show originally aired on CBS in the Fall 1977 TV season at 10:30 a.m. Saturday mornings. Its competition included I am the Greatest: The Adventures of Muhammad Ali on NBC and Scooby's All-Star Laff-A-Lympics on ABC. Space Academy was moved to the 12:30 p.m. slot mid-season, which proved to be a bit problematic for the show since network affiliates could switch to local programming at noon and our local CBS affiliate at the time, WAST (later WNYT) Channel 13—Albany, often did. By mid-season, however, the show had burned off all the first-run episodes and went into repeats. Still, it could not have been good for ratings. If it wasn’t getting preempted by local programming, by noon most kids had been stuck in front of the television for four to five straight hours and were getting summarily kicked out of the house by frustrated parents. One aspect of the show that made an immediate impression was the relative high quality of the special effects given the limitations of technology of the era and the small budget. Scheimer hired two of the model makers from the U.S.-based team that had been working on Star Wars. While visiting their studio, Scheimer saw R2D2 and C3PO, as well as various ship models, and one wonders if this where he got the idea for the self-aware, smart-aleck, half-meter tall robot named Peepo (originally Loki’s name). 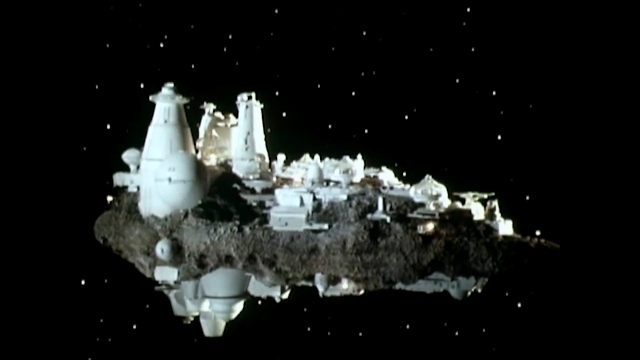 The most impressive model was that of the Space Academy asteroid — a colony in space densely populated by various structures and domes that would be at home in any Star Trek or Space: 1999 episode. 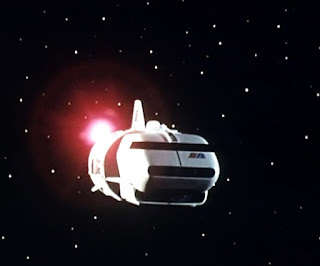 The Seeker shuttlecraft, Space Academy’s small scout ship, shows the level of detail the special effects team put into the models. In fact, on both the exterior and interior, the vessel is an improvement on Star Trek: The Original Series’ Galileo 7 shuttle. 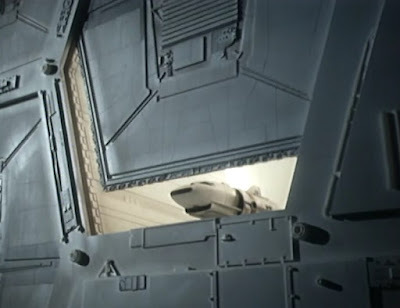 The Seeker has a layered design with access hatches, umbilical connections, and a richly appointed interior whereas the Galileo 7 had few surface details and a rather Spartan interior (the nose of the Seeker comes from the vehicle in Ark II, another Norm Prescott and Lou Scheimer production from the Fall 1976 season). The Seeker, left, and Ark II, right. It took ingenuity to compensate for the penny-pinching budget Filmation provided. For example, rather than film the models against a blue screen and superimpose a star field using chroma key, they bought white Christmas tree lights, attached them to a background, and spray-painted everything black. Then, by scratching away bits of paint off the bulbs, they created the illusion of stars of different magnitude, sped up the production process, and created an impressive effect. The effects, except for the budget, are about on par with Battlestar Galactica and Buck Rogers in the 25th Century, two other notable 70s sci-fi series. Chuck Comisky, special effects supervisor for Space Academy, went on to work on several James Cameron projects, including Avatar, Battle Beyond the Stars, and Ghosts of the Abyss, as well as other productions such as The Crow and Jaws 3-D. When Filmation folded in 1989, rights to Space Academy went to “Sleepy Kids,” a media company established in 1989 specializing in children’s shows, later renamed Entertainment Rights. The DVD release of the Space Academy series was issued in 2007 by BCI Eclipse which licensed the series from Entertainment Rights. BCI Eclipse went out of business in 2008, followed by Entertainment Rights in 2009. As a result, the rights to the show are in something of a gray area right now. 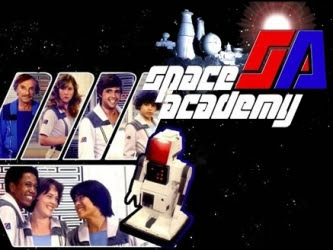 Despite getting cancelled after only one season, Space Academy was popular enough to warrant a spin-off, Jason of Star Command, which ran for two seasons and recycled the models, props, and sets from its parent show. 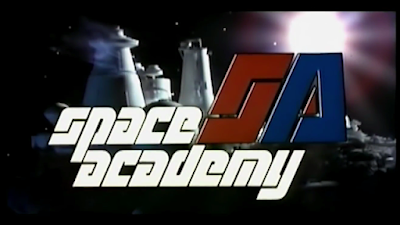 In content, design, and scripting, Space Academy is a quintessential 70s sci-fi show. 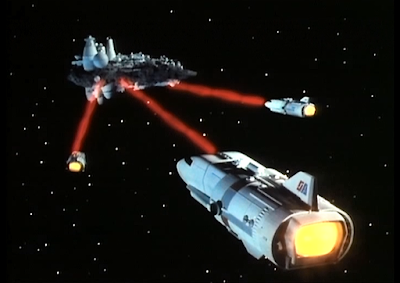 The series , and in particular the special effects, bridges the gap between Star Trek and Star Wars and represents one of the most notable achievements by Filmation. Descriptions by G. Jack Urso. Click on the links to view the episodes on the Aeolus 13 Umbra YouTube channel! Space Academy Cast (left to right): Top: Commander Gampu, Laura, Chris, and Loki. Bottom: Paul, Adrian, Tee Gar, and Peepo. The Space Academy team encounters an alien boy (Loki) on a planet due to explode. This episode echoes certain plot points of Star Trek: The Original series’ first episode “Charlie X” about a boy with unique powers left to lead a lonely existence among intangible aliens. While on a mission in space, Gampu and Laura get caught in a black hole. Chris attempts to mind-link with Laura to effect a rescue. When an asteroid heading for Space Academy is destroyed, academy personnel disappear. Unlike the other episodes in the series, rather than a cold opening, this episode begins with a teaser before the title credits. While cleaning up space debris left over from the Vegan Wars, a mine attaches itself to Blue Team’s Seeker shuttlecraft. When a Vegan warrior is revived from cryogenic stasis, he continues the war with the Blue Team as his targets. A shapeshifter who says he’s from Loki’s planet tries to convince Loki to help him steal information from Space Academy. Blue Team investigates two comets on course to collide with Space Academy and discovers they are living beings. One comet is bent on destruction — can the other living comet help Blue Team save Space Academy? When the Alturos space mirror stops rotating and sends the planet into a deep freeze, Chris, along with stowaways Loki and a trained chimpanzee named Jake, investigate, but they soon end up in trouble as well. A “phantom planet” appears around Proteus IX-B, a former asteroid mining colony about to be destroyed, Blue Team investigates by having Chris and Laura use their telepathic powers to conduct a séance. They speak with a ghost and discover they need to conduct a risky rescue. A Seeker coming in for a landing to Space Academy. Tee Gar takes his new invention, an instant freezing device called a “cryotron,” to test it on the planet Delius. Unbeknownst to Tee Gar, the cryotron causes the items it freezes to explode. When a Delian giant named Dramon gains possession of the cryotron and freezes Peepo, Blue Team must ask fast to save the robot. Special guest star Don Pedro Colley (THX-1138). During a Zollium-extraction mission, Gampu makes a mistake that puts Paul in danger and shuts down Peepo. Is it time for the 300 year old commander of Space Academy to retire? One cadet thinks so, but it’s up to Gampu to save her when she gets in trouble. Space Academy cadet Matt Prentis is allowed to lead a mission to Asteroid BX-3 and shut down its leaking nuclear reactor even though he is being investigated for breaking safety regulations. Nevertheless, the team soon finds itself in danger under Prentis’ command. A star about to go nova, a robot war machine, and Gampu’s ex-girlfriend keep the action moving in this episode. Guest stars Dena Dietrich (Mother Nature in the 1970s Chiffon margarine commercials) and a redress of Robby the Robot from Forbidden Planet (1956). A Seeker gets ready to launch. Stand by for Star Speed! Loki skipping class and going on a joyride with Peepo give two adolescent energy beings the opportunity to wreak havoc at Space Academy. In the Alderan Triangle (Space Academy’s version of the Bermuda Triangle), Paul and Chris, members of Blue Team, encounter the thousand year-old Starship Hope, which resembles the Space Academy asteroid. When Gampu and others investigate, they find Starship Hope’s commander, Captain Rampo, the Flying Dutchman of Outer Space. Guest star Howard Morris (Ernest T. Bass on The Andy Griffith Show). Written by Samuel A Peeples, who also wrote episodes for Star Trek: The Original Series and Star Trek: The Animated Series. Just as Gampu's eccentric, technophobic “back-to-nature” brother Professor Johnny Sunseed arrives, an outbreak of hallucinations and euphoria caused by genetically-modified “space lettuce” spreads throughout Space Academy. The Sunseed character is set up to return in a supporting role at the end of this episode, but the series was cancelled. A behind-the-scenes look at the 1970s Saturday morning children's sci-fi series featuring interviews with cast and crew. Seekers using presser beams try to save Space Academy from certain disaster!